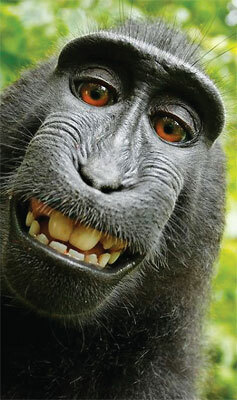 Who owns the rights to this monkey selfie? If a monkey takes a photograph, who owns the rights to it? The monkey or the owner of the camera? That’s the question being discussed all over the Internet about this toothy selfie a macaque monkey “took” of itself with photographer David Slater’s camera. Slater travelled to Indonesia in 2011 to get the perfect image of a black crested macaque. One of the monkeys came to check out his camera and took hundreds of photos of itself accidentally. Most of the photos were blurry, but one of them was a cute self-portrait of a monkey appearing to grin.Now the image, and another in-focus selfie, has been uploaded to Wikipedia and Slater is not pleased. He has asked Wikimedia, the organisation behind Wikipedia, to remove the image from its pages because he owns the rights to it. It is included in an image library that allows other websites to use it for free, it is harming his right to make money from “his” photo. Wikimedia Commons is a collection of over 22 million images and videos that are free to use online. Because the photos are on that site, people are free to use it and republish it without having to pay Slater a sum of money, known as a royalty, to use it. But Wikimedia says that because the monkey pressed the button to take the photo, Slater does not own the right to the photo and it is uncopyrightable. Copyright Compendium, a copyright law, states that animals cannot own copyrights. “The term ‘authorship’ implies that, for a work to be copyrightable, it must owe its origin to a human being. Materials produced solely by nature, by plants, or by animals are not copyrightable.”Slater argues that the image was not produced solely by the macaque because a monkey pressed a button, but he did all the setting up.“If the monkey took it, it owns the copyright, not me; that’s [Wikimedia's] basic argument. What they don’t realise is that it needs a court to decide that. I’ve told them it’s not pubic domain, they’ve got no right to say that it’s public domain,” explained Slater. Look before and after you lick! It seems too good to be true, but a Spanish physicist has invented a colour-changing ice cream that changes shades as you lick it! The ice cream is called Xamaleon, and so far Manuel Linares, its inventor, has only created one flavour, tutti-frutti. It turns from pale purple to fuchsia with a lick of the tongue. Linares studied Electrical Engineering and Physics but is currently teaching high school Physics and Math. He invented Xamaleon when he enrolled in the Hoffman School of Cuisine to get rid of some of the stress brought on by teaching. Linares developed a knack for making ice cream and became a student of ANHCEA (Natural Business Association of Artisans and Merchants Processors of Ice Cream and Horchatas). There his teacher proposed lots of ice cream-related challenges –creating hot ice cream was one of them. He specifically challenged physicist Linares to come up with a colour-changing ice cream. Linares didn’t think his invention would be such a big deal, but so far since he launched Xamaleon in June he’s received calls and emails from small ice cream businesses in Singapore, Russia, Germany, Miami who are looking to sell it. The future of Xamaleon looks bright, but Linares isn’t getting too excited yet. He plans to keep teaching in the fall and see where Xamaleon takes him.